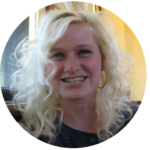 When we stepped out of the Subway station into Harvard Square, a giant yellow and red banner immediately caught our eye. Man in a yellow hat, red book cover, brown monkey? 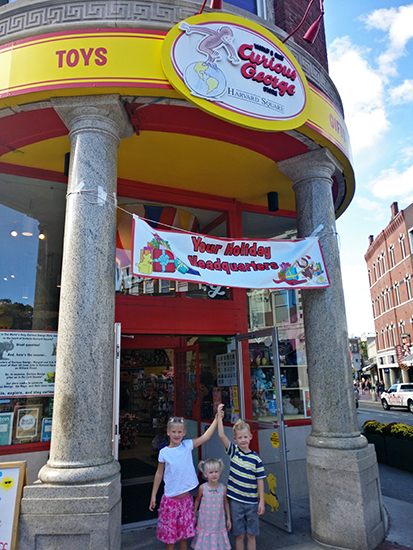 We had just stumbled upon The World’s Only Curious George Toy Store! Located on a corner lot, this unique building was as fun on the outside as it was on the inside! 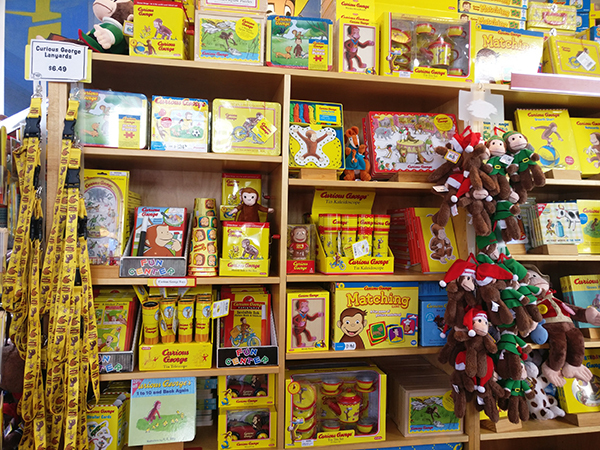 The walls are stacked high with plush Curious George’s, walls and walls of books, a reading corner, games, tea sets, knick knacks, lunch boxes, card games and matching games, lanyards, periscopes and tons of other Curious George goodies. Plus, there are walls of mesmerizing changing coloring balls, science kits, puppies in purses, toy dinosaurs, stickers and more. 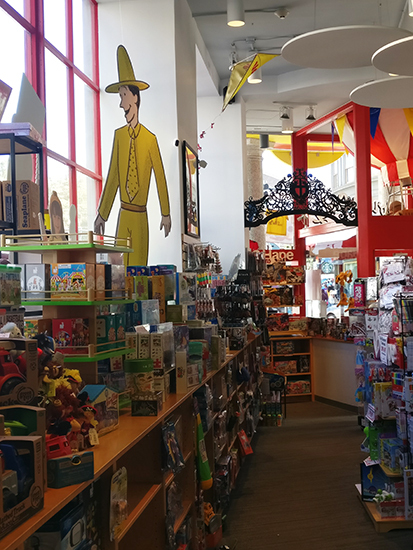 If Curious George stepped foot in this store, an immediate avalanche of toys would pour out onto JFK Street and come spilling down through the streets. This store has everything that would peak little George’s curiosity as he sends everything crashing to the ground. 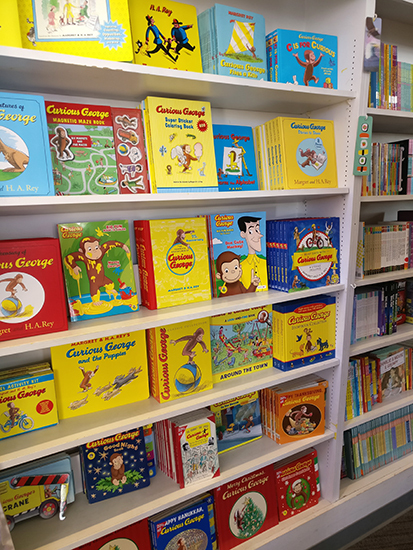 Though you can find a little bit of everything here, the majority of the merchandise, well over 60%, is all Curious George. The man in the yellow hat stands tall in the east window, making sure you aren’t getting into too much mischief, or perhaps ensuring Curious George himself isn’t about to set everything loose. 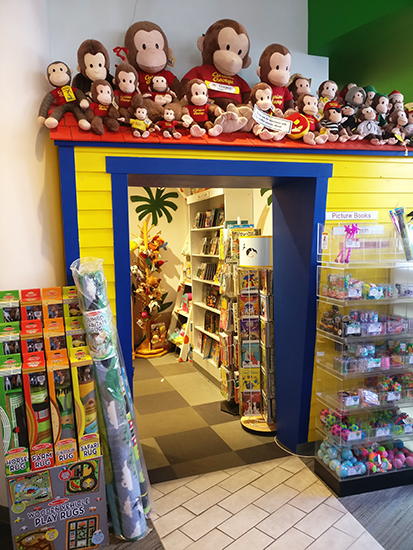 There is Curious George’s house, a little room tucked into the back of the store with a monkey sized door full of toys and books to read. 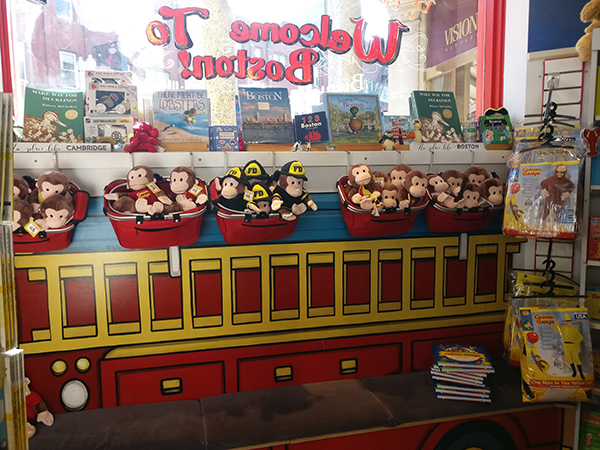 There is a reading corner on the west side of the store with a plush bench and Curious George’s to keep you company. The center turnstile is filled with plushies, small toys that can fit into your hand and coloring utensils. Widmore absolutely loved Curious George well into this third birthday. We bought him a large collection of Curious George stories that we read to him every single night, and I can’t count how many times we’ve watched, Curious George: A Halloween Boo Fest. I can recite it word for word. A little monkey that gets into trouble at every turn is a little boy’s wish come true. He’s since moved on to a passion for Hulk Smash, also fitting for a growing boy who wants to be big and strong like his dad and protect his mom and sisters. 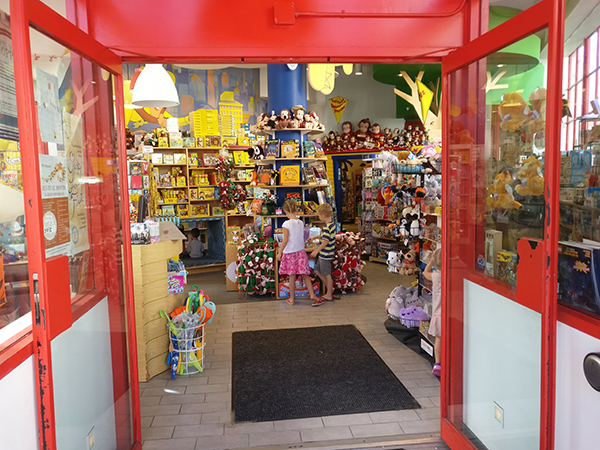 ► For Kids: This is such a fun little store, and definitely a novel one at that. It’s a one of a kind store, and should be on every family’s agenda when they come to Boston. 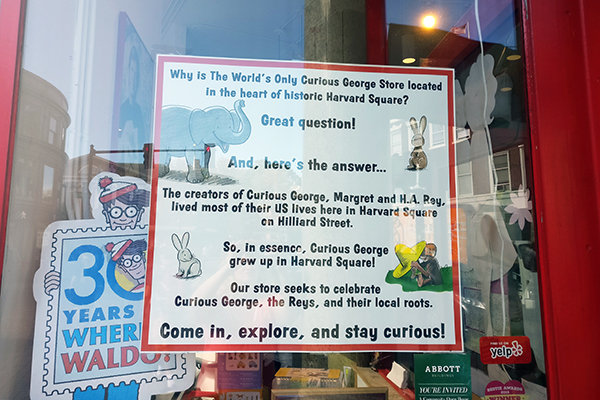 It is, after all, The World’s Only Curious George Toy Store. The markup is a little steep, but it’s well worth a look around and gives the kids an opportunity to shake out a few wiggles. Have you been to this unique store? 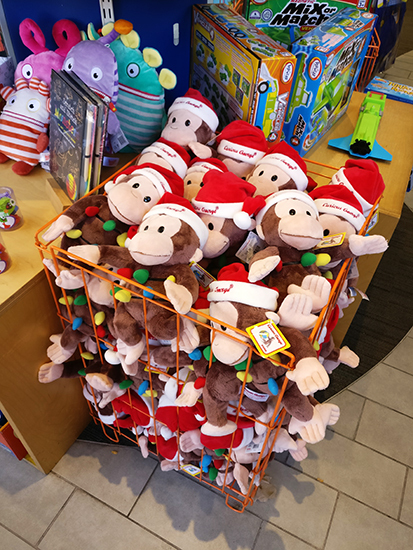 Did you take home a lovable little mischievous monkey? Let us know what you thought in the comments! 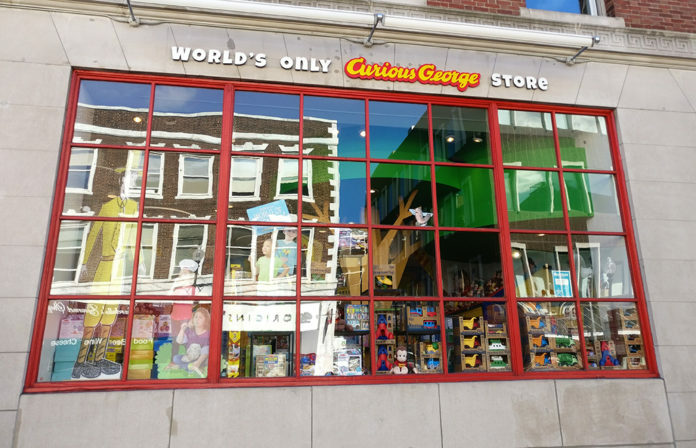 ► Nap-Time Version: Our family trip to The World’s Only Curious George Toy Store. 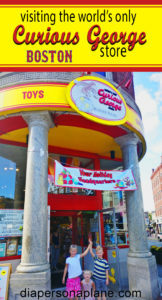 Check out our review of the cupcake emporium Sweet Bakery just next door to Curious George, our fun adventure on the Freedom Trail and our wicked awesome hot Lobster Roll at Quincy Market (all coming soon).